We are engaged in offering a wide range of Mineral Water Caps to the clients. These products are made by our experts ensuring that these conform to the set market standards. 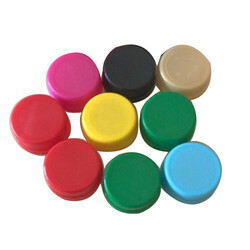 We are Leading manufacturer and Suppliers of Water Bottle Cap for 28 mm neck size. These Water Bottle Cap use for 1 Ltr Water Bottle. Safe from heating, these SS Water Bottle Caps are best in working and completely safe to use up to longer years. Made with insulated frame, these casseroles are small in size and best to use for kitchen purpose. Eye catchy in look, these Water Bottle Steel Cap are quality approved by the professionals several times. We are engaged in offering high performing 27mm Alaska Caps in the global areas. Our 27mm Alaska Caps are suitable for packing drinking water and oil, etc. We have provided 27mm Alaska Caps to leading brands like Bisleri and Aquafina. We are having 28mm pco closure with double seal and cold filling conditions. For cost effective option we are supplying three start closure for packaged drinking water. Our 55mm bubble top closure is used for 20 ltr. PET mineral water jar manufacturers. These are available in various colours as per requirement of customers.